This course is for focused people age 10 - 13 who wish to train equally in dance, voice and acting. 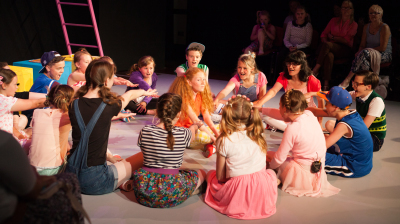 It is the last course in our junior development programme before our musical theatre training options. The course is intense, focused and leads young people to become aware of the skills needed to enter the performance industry. Students explore dance, voice and acting technique and create performance work at a high standard. Dance: Our dance training in based around the student's ability level. Each student is placed in a class, which will push them and build proper technique. Training styles are based around Jazz, Street, and Ballet. Routines are taught to a range of music genres. Voice: Our voice training is based around building vocal technique and ensemble singing with the opportunity to sing solo. Students are taught how to use their voice correctly. Students learn how to act through song and the technical requirements needed to produce a good, safe sound. Students are also taught ensemble skills and are exposed to a multitude of styles to help develop a varied repertoire. Acting: Acting is of prime importance in performance. It must be considered when dancing and singing, as well as in spoken text. Students study acting through song, improvisation, expression, team buidling, character, posture, projection, accents and more. The course aims to bring students to a new level of creativity and self-awareness. The course is great if you want to learn alongside like-minded individuals and be pushed to reach your potential. Age 10 - 13 is a critical age in performance development. Students are usually full of enthusiasm and ready to take on challenges.